The scenery in the desert across Nevada is absolutely amazing with everything from high desert to natural wonders like the Red Rocks. Nevada also has some other worldly adventures in hiking with a nod to the often-rumored alien activity at Area 51. 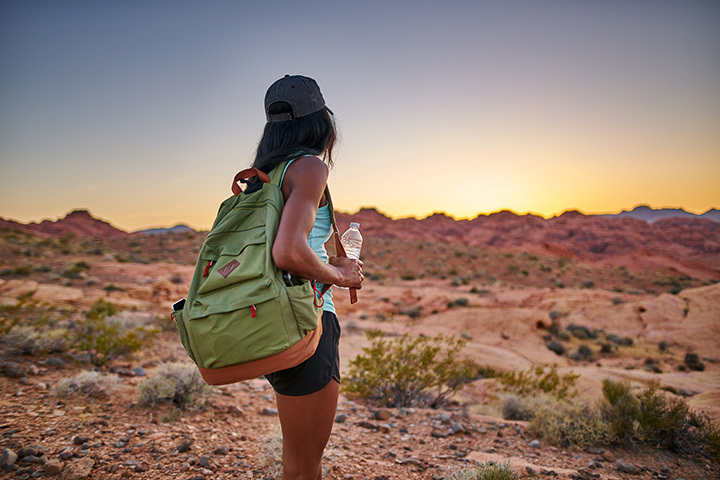 Whether you are looking for a natural adventure in a scenic spot or to see something out of this world, exploring one of these top 15 hiking trails in Nevada is worth the energy and time. With the rumors and urban legends surrounding the UFO activity at Area 51, many want to be able to see just what is going on at the reported military base. A hike up Tikaboo Peak offers a bird’s eye view of the military base that is rumored to attract if not study the spaceships often viewed over the Nevada desert. The trip to get to the trail is tough by itself, which only adds to the adventure. You will need a strong four-wheel drive vehicle and a personal sense of adventure to tackle this rough trek but think of the stories you will have if you happen to catch a glimpse of something out of this world. Nevada's first National Conservation Area, Red Rock Canyon is a majestic example of the Mojave Desert landscape. There are countless hiking trails through out the area with rock climbing options included. Just 17 miles from the Las Vegas strip, this natural wonder is a world apart from the big city. When most people think of Nevada, you generally do not picture marshes or wetlands but the Wildlife Refuge at Pahranagat offers an often overlooked view into the diversity of environments in Nevada. This one piece of land offers hikers a journey from desert to wetlands with several animal friendly habitats in between. This is home to a very rare site in the desert, a wetland that plays a significant role in water fowl migration patterns. Starting at the Rainbow Vista trail head, this three-mile hike gives you a glimpse into another vantage point of the famous Nevada desert. The hike has several highlights including the sand dunes and the viewpoint overlooking the Silica Dome. The park is a short drive from Las Vegas and well worth an afternoon away from the fast-paced city. The sandstone traveled by thousands each year is millions of years old and a perfect background for some great vacation pictures. This 3.7-mile hike offers a unique view of the desert via a series of retired railroad tunnels. It's been many years since the tracks were removed, but the trails still give hikers breathtaking views of Lake Mead and Boulder Basin. The terrain is pretty easy to hike but the open desert can be challenging for those not use to the heat. The hike to Big Falls starts with an advanced trail to the Mary Jane switchback and falls. The first part of the hike is 1.7 miles of challenging trails that lead to an unmarked path to the ultimate view of Big Falls. If you are impressed with Mary Jane Falls you will be blown away by the contrast of Big Falls and the desert. This relativity easy hike offers a great reward: A stunning view of the Las Vegas strip. The trail start is a little off the beaten path of the Red Rock Canyon scenic drive but this means it is also much less crowded than some of the busier hiking trails. This is a family-friendly hike with some fun photo opportunities like the ability to “hold” some key Las Vegas landmarks to share with family back home. Combine a day of ghostly mine tours with a hike of the surrounding canyon for a fun day for the whole family. The tours themselves offer a bit of a hike but the canyons surrounding the old mining town also hold a haunted element according to urban legends due to flash flooding in the area in recent history. The hikes can be a little beyond a beginner level so it is best to come prepared with solid hiking shoes and plenty of water. Often described as an oasis in the Mojave Desert, this is a pretty simple hike within a very short distance of Las Vegas. The gorgeous wetlands and series of lakes will change the way you envision the desert. This short day hike makes a great family-friendly break from all that is Las Vegas. It is also a great date spot since many have no idea that this marshy wonderland even exists. This hike also lends itself to a pretty view of the surrounding mountains and a glimpse at the historic workings of the Tule Springs Ranch. The park is 680 acres. Hiking Sloan Canyon transports you back in time as you explore the amazing collection of ancient rock art in the form of cave drawings. Visitors to this often challenging loop that measures about five and a half miles are reminded to respect the petroglyph. The trail has many large dips and climbs that can be tough for a beginner but are well worth the reward of the views and the art. Voted one of the best trails in the Reno area, this trek is both dog and horse friendly if you prefer to share the trail with a family pet. The 5.7-mile hike can be a challenge for a beginner so it is generally a better match for a moderate skill level. The reward for this challenging hike is the waterfall and the greenery that fill the view at the top. It is a nice break outside of Reno so explore something beyond the typical desert landscape. An interesting glimpse into both mining and the charcoal manufacturing process of the late 1800s, the huge charcoal ovens are a tourist attraction at the start of many of the hiking trails. These trails offer sweeping views of the desert landscape in the spring and summer but also open to snowshoeing opportunities for winter hikers. Many visitors enjoy the seasonal contrast on return visits. Along some of the trails there is also a chance to fish and even camp. The trip to get to this location is far beyond many of the larger cities but it is worth the drive with so many recreational options to combine with a hike. This beautiful park combines the desert basin landscape with the shores of the reservoir. Hikes in this area include stops to see local examples of early settlements as well as a wide range of wildlife like an expansive range of birds including water fowl, small brush animals and larger native species like an occasional bobcat or coyote. As far as state parks go, this park offers something for every family member as there is a very stark contrast between the ghost town of Berlin which was famous for it's place in mining history and the prehistoric fossils of the Ichthyosaur found on site. A hike between the ghost town to the fossil shelters offers a glimpse into Nevada history very few actually get to experience. The desert environment has been very supportive as far as preserving both the buildings left behind long ago and fossils of huge marine mammals. View more Nevada Hiking Trails.